Peregrine Falcons call 2400 Chestnut "home"
Among our many valued residents, 2400 Chestnut can count a pair of Peregrine Falcons that call our roof "home". One of the most spectacular of all birds, the Peregrine Falcon was nearly extinct by 1970, on account of pesticides such as DDT disrupting their reproductive activity. 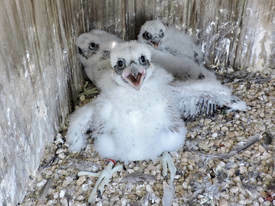 Continuing recovery efforts enabled the Peregrine Falcon population to rebound over time, and in 1999 the Peregrine was delisted from the Endangered Species list. The Peregrine Falcon is often stated to be the fastest animal on the planet in its hunting dive, the stoop, which involves soaring to a great height and then diving steeply at speeds commonly said to be over 200mph. 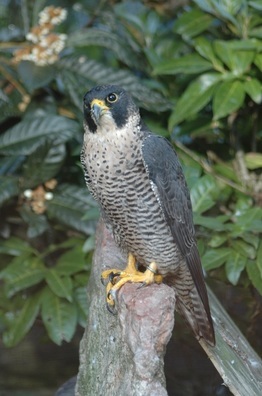 Peregrine Falcons have adapted to living in cities such as Philadelphia. Cities offer tall buildings with ledges for nesting, water sources, large populations of pigeons and starlings for food, and have few natural predators. 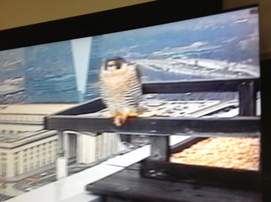 Towards 2008, it was discovered that Peregrine Falcons were spending quality time on the roof of 2400 Chestnut, hunting and dining on the local avian population. 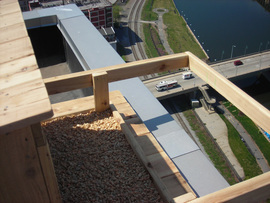 At that point, 2400 Chestnut management teamed up with some area conservationists to develop plans for a nestbox to be situated on the roof of 2400 Chestnut, to further encourage Peregrine Falcon breeding. In recent years, 10 falcons have fledged from the 2400 nestbox - four in 2015, three in 2016, and three in 2017. 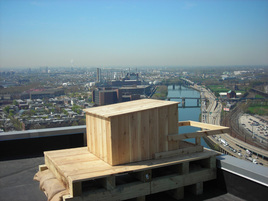 The nest box, added in 2009, can be seen at right, overlooking the Schuylkill River. Falcons typically nest on a shallow, unlined surface called a scrape. In the wild, this may be a cliff's edge, while in the city, any kind of pebbled surface will do. 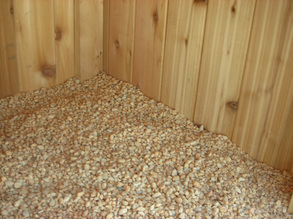 Hence the nest box is filled with properly-sized pea gravel. Although the nest box was installed in time for the 2009 breeding season, it was only in 2015 that 2400 hosted our first successful nesting pair! At left, a camera phone grab shot of a mature bird, seen in October of 2012 on the 2400 nest box via one of the falcon cam cable channels available in the building (channels 11 & 13). 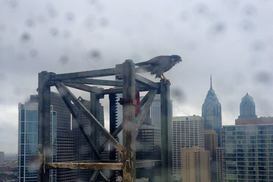 At left, a peregrine photographed on top of window installation staging equipment, from August of 2014. 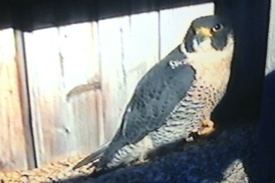 At left, a mature peregrine, sitting on the scrape in the 2400 nest box, seen via one of the falcon cam cable channels available in the building (channels 11 & 13). At left, the three fledglings from 2017. They were banded by the Pennsylvania Game Commission to make future identification easier. ​Check back with 2400chestnut.com to stay up-to-date with the 2400 Falcons.